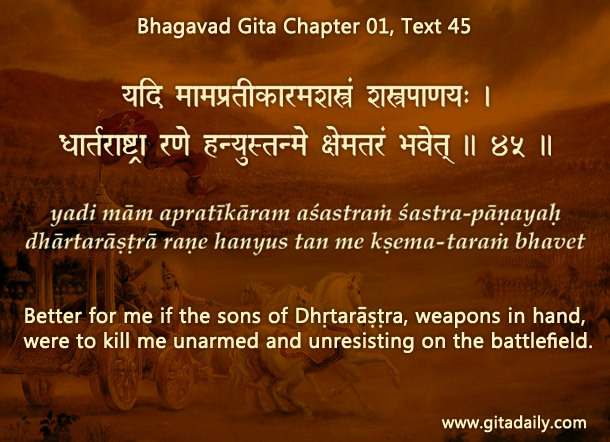 The Bhagavad-gita (01.45) begins with a death wish. Arjuna is faced with the horrendous prospect of a fratricidal war against his loved ones, especially his venerable elders. Recoiling from that nightmarish prospect, he says that he would prefer to die rather than succumb to something so terrible, all for the sake of money in the form of a kingdom. We too may get a death wish — life may sometimes confront us with such mortifying adversities that we may feel as if life itself is not worth living; whatever we do it seems will only worsen the situation, not resolve it. At such times, the Gita’s timeless wisdom can raise our vision beyond the material level of reality that is the source and the arena of perplexities and adversities. The Gita helps us understand that we are indestructible spiritual beings, for whom death is only a transition, not a termination. So, death will not solve our problems for the karmic complications that have caused those problems will chase us doggedly and come upon us in our next incarnation and incarceration. More importantly and more hope-impartingly, we need to recognize that Krishna’s love for us stands tall above whatever problems afflict us presently. Every situation is an opportunity to love and serve Krishna, no matter what happens. By focusing on how we can serve him in the present situation instead of lamenting about how or why things are not going according to our plan, we can shift our focus from the adversity or the perplexity to the opportunity. And the resulting positivity, when empowered with Gita wisdom, can be so transforming that it infuses us with an indefatigable purpose for our life, thereby giving the death sentence to the death wish. On hearing and understanding the Gita, Arjuna exiled his death wish; indeed, we can say that he gave the death sentence to that death wish. Far from wallowing in self-pity or any other form of self-induced misery, he rose with determination and devotion, ready to fight for his life — not just his bodily life in this world but also his eternal life in the spiritual world in immortal love for Krishna.